Or as I like to call it, PHIL’S GRILL (What it should be called!). It’s Phil himself! Ok, just a cardboard cut out of him. Okay, I had to do it. I had to review Phil’s. There is not one smoker on their premises, which would indicate they don’t smoke any of their meats and truthfully, they don’t. 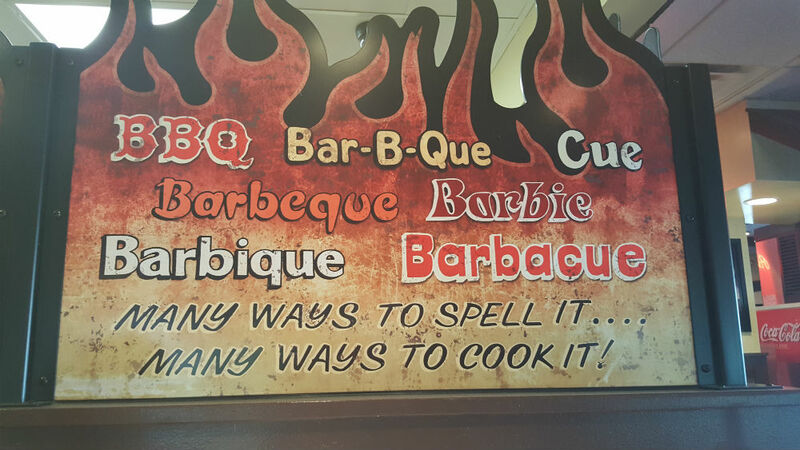 And those of us that write about or just love BBQ, know you shouldn’t call it that unless there is a smoker somewhere. 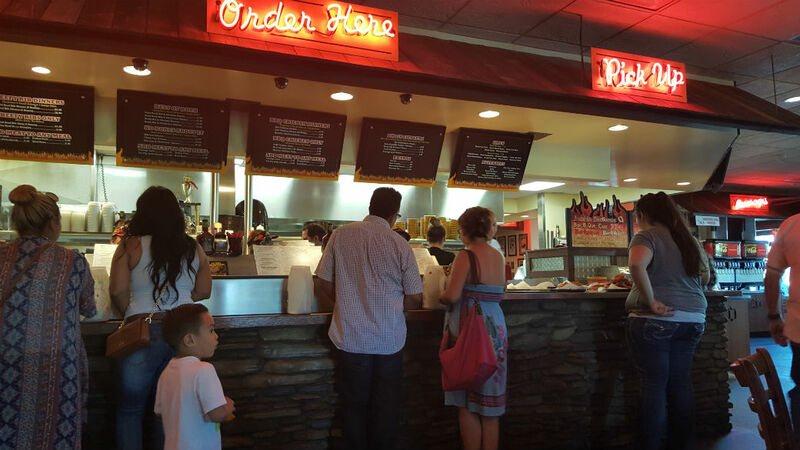 But Phil’s is not only THE busiest BBQ joint in San Diego, it can now be considered a growing empire. 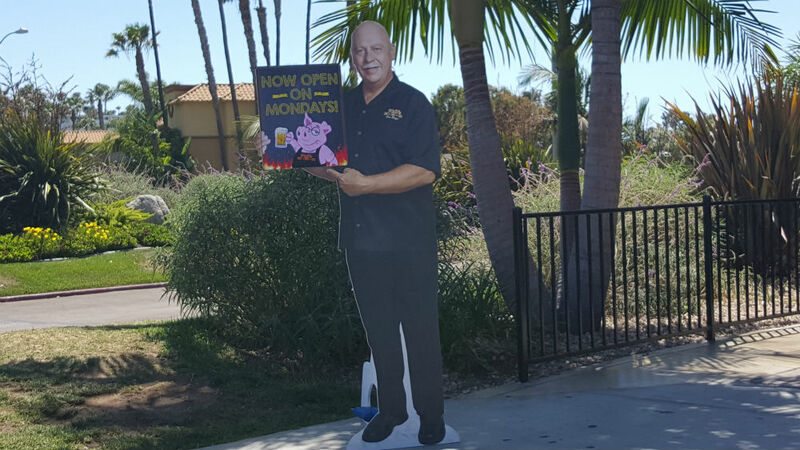 Over the last seventeen years in business, Phil’s popularity has allowed him to open 5 restaurants including one of them in Petco Park and another at the San Diego International Airport. A 6th restaurant is being bulit in Rancho Bernardo as I write. The extremely long lines around all of his joints justify new openings no doubt. Counter service only. But staff will bring you most anything you need. What’s my gripe with Phil? When I met him a few years ago at his restaurant, it was before I was even a judge. I asked him if he smoked his meats. He replied, “No, all the meat is mesquite grilled, so you’re right, it’s not a true BBQ.” I then semi joked with him and said, “Then why don’t you call it Phil’s Grill? It rhymes and is more truthful.” He just laughed…..all the way to the bank! I don’t have any animosity towards Phil personally or his establishments; I just don’t like the fact that I have to constantly educate people on what the term BBQ truly means when they think it’s what’s going on at Mr. Pace’s places. Damn, there’s that rhyming thing again. Does Phil’s use bottled liquid smoke as some people swear by? I don’t know. Some say they can taste it. Since I don’t taste any smoke on his meats I’m going to assume he doesn’t at this point. That would be considered cheating anyway. I don’t want to think Phil would do that. But in competition, we’re not even allowed to judge smoke, because they could be using liquid smoke and then that IS considered cheating. So there. Love this sign. So many ways to spell it! But no BBQ Blog on local BBQ restaus is going to be considered complete if I just ignore Phil’s. It’s not going away anytime soon, that’s for sure. And I will give him kudos for his charitable donations to a lot of local causes. He would need to; if not just for a tax write off alone with all the buckaroos his places rake in! Thanks for constantly giving back to San Diego! Ok, onto the food. That’s what you’re here for after all, yes? Right off the bat, nothing here is bad. Truthfully though, I don’t care for his sauce at all, too overly cloying (definition on Google; syrupy, saccharine) for me. There is no depth of flavor in his sauce, at all. And experts say, when meat comes slathered in sauce, they are trying to hide something. Usually it’s because they may be trying to mislead you by using liquid smoke, or something else not Kosher (funny word considering there is pork being served here!). I actually enjoy some of Phil’s dishes, but I secretly bring my friend’s BBQ sauce in with me in a plastic container….shhhhh!! Obviously, the general public may not agree with me, as his sauce is ubiquitous: meaning it is sold pretty much everywhere. Ribs here are good, but the one time I asked for no sauce on them, they really lacked a lot. I realize ya gotta let them do their “wet” thing, just not poured all over it. They put a bit of their sauce on there and then most likely bake it in an oven for a bit for that slight glaze. Ribs were tender and pulled away from the bone easily and are quite meaty for baby backs. They do give you the option to order them in 3 different sizes. Full, half and quarter racks. My favorite dish here is the pulled pork Sammie, called the Broham. I don’t like it when they pour that way too sweet sauce all over it and it is a mess to pick up. But I’ll tell ya, for not being smoked, their meat on this is still pretty tastily seasoned and moist. I actually love the bun they serve it on. It has just the right amount of chewiness to it that I like and usually can’t find anywhere else. Slightly toasted too. I don’t usually talk prices much as they change too often, but for $6.95 which it has been for a few years I think, it’s a good deal. There is enough meat on this Sammie to make two of them. Combined with their very good and abundant, skin-on fries for a $1.50 more, it’s still a good price point. Phil’s does have one of the better beef ribs. While they are fatty (where the flavor is kids) they are also tender. Considering I just had a beef rib at the Barbeque Pit last week that I was not able to get even one bite out of because of its toughness, this is a feat in and of itself. Most beef ribs everywhere are too fatty and tough. His seemingly, are consistently good the few times I’ve had them. I have never ordered his tri tip sandwich because I’ve just never had much luck with that cut of meat. Probably because I’ve had it on backyard grills and it’s always been too tough for me. Phil’s slices his very thin (see my review on Cali Comfort to find out why he cuts it like that) and it’s tender, juicy and full of flavor. I had a nice order of this on the side for just a few bucks more and it was enough to make a couple of sandwiches with. I also tried his sausage and while it wasn’t the best I’ve had, it was a large piece. It was missing the required spiciness and thus lacked flavor for me. As for his sides, I like to stick with the fries and the cole slaw. When cooked slightly crispy, Phil’s has some of the better French fries anywhere and you get a whopping portion of them. I used to detest cole slaw and would say please do not put it on my sandwich here and everywhere else they serve it that way. But I’ve now come to like Phil’s slaw the best. I still ask for it on the side, so as not to make my bread soggy. I only wish it were a bit less sweet. I’m not a fan of his onion rings because there is just too much breading on them for my liking. I do love OR’s and like beer batter, but I’m pretty picky about them. My favorite OR’s are served at the BBQ House in Ocean Beach and at Cali Comfort. They’re just right. Phil’s in Point Loma is the closest to me, so that’s the one I’ve been to the most. I went to the San Marcos one soon after it opened as my son lives out that way and the food was consistent. They do have some of the friendliest staff anywhere. Love the lady at the podium in Point Loma, she keeps everyone in line and she is super warm and friendly. Will I return to Phil’s? Yeah, probably. Most likely for the Broham and his beef ribs. And at least I can say that none of Phil’s meats are dried out like some other places. 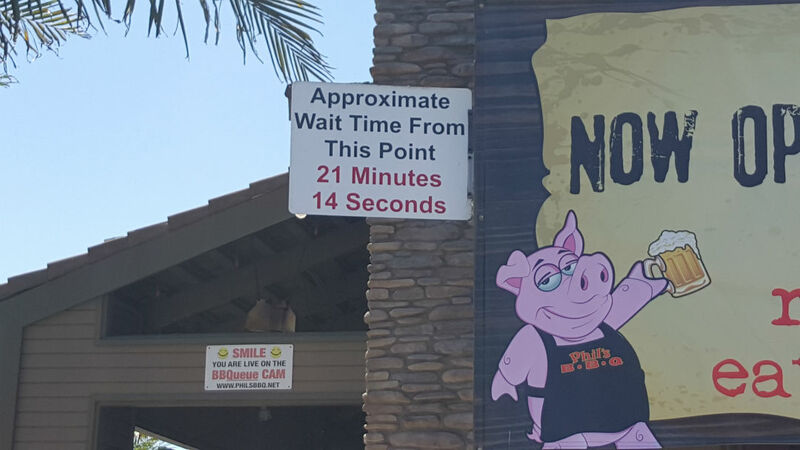 But ya just gotta hit them at the right time of day, which would be in between lunch and dinner….like 3-4 pm to avoid those long lines everyone complains about. Except for Phil. Gotta hit Phil’s at the right time of day. Or this! Point Loma, San Marcos and Santee. Rancho Bernardo coming soon.